I love poppers, but I’m not a big fan of the crust they use on the poppers you buy in the store, and I’ve tried making them at home. For some reason, they haven’t turned out well for me. My solution: Wonton wrappers. 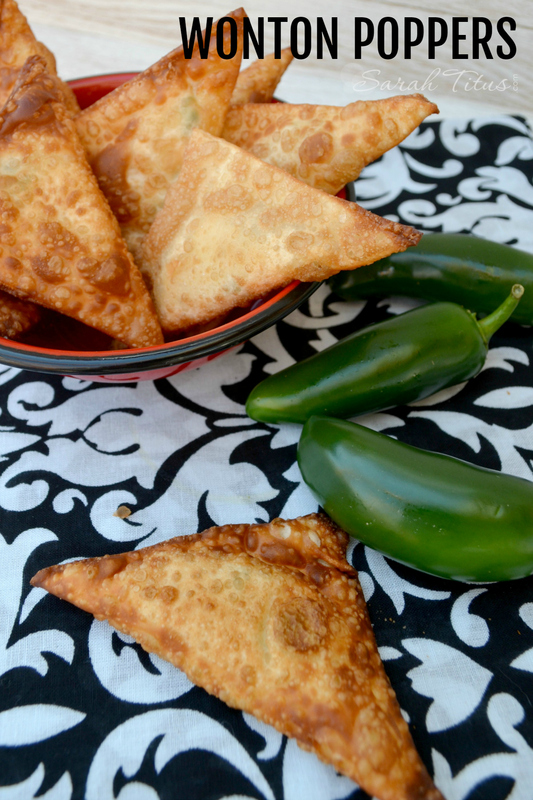 Not only are they much easier to cook, they are much crispier and taste a whole lot better! Next time you’re hosting that big get-together, bring on the Wonton Poppers. It’s a crowd favorite! Step 1: Mix the cream cheese, Mexi-blend cheese, mozzarella cheese, ranch and peppers into a bowl, mix well. 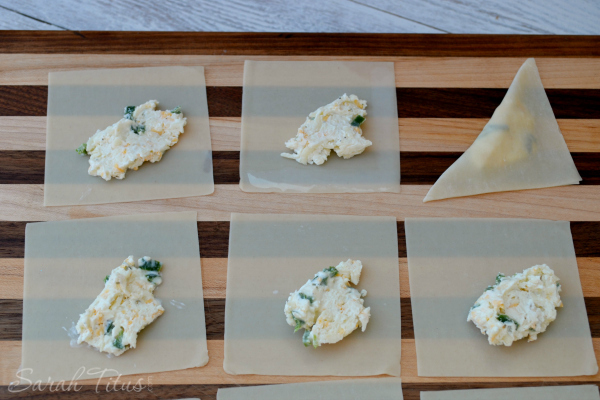 Step 2: Open your wonton wraps, place them on a flat surface put a tablespoon of filling in the middle of each wonton. Step 3: Dip your finger in water and wet the edges of the wonton, fold it over in half and press the edges together. Step 4: The water will act like glue to seal them shut. Step 5: Fry the wontons in oil over medium- high heat. Cook them for 15-20 seconds on each side, take out of hot oil and let drain on a paper towel. 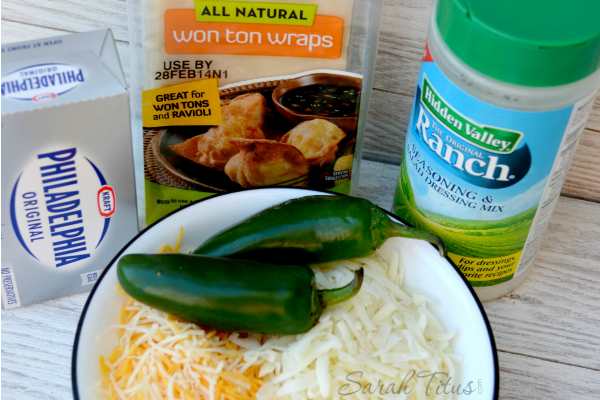 Mix the cream cheese, Mexi-blend cheese, mozzarella cheese, ranch and peppers into a bowl, mix well. 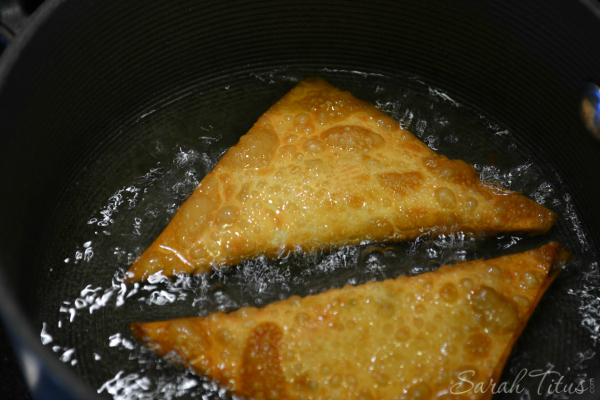 Dip your finger in water and wet the edges of the wonton, fold it over in half and press the edges together. The water will act like glue to seal them shut. Fry the wontons in oil over medium- high heat. Cook them for 15-20 seconds on each side, take out of hot oil and let drain on a paper towel. 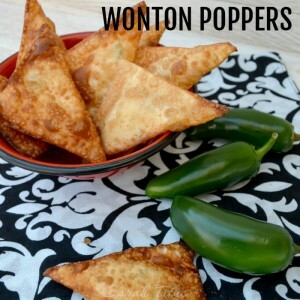 What’s your favorite recipe to make using Wonton wrappers? Oooh YUM! I love this idea. We do it with crab and garlic and a bit of sweet/sugar (the obvious) but this looks great. Can’t wait to try it with my “Popper lover”! I’ve not tried them with crab…but that sounds like a good idea. 🙂 Thanks for sharing.